Storage is more important than ever in the digital World. You’ll need somewhere to store your archived music library and of course the new music that you buy either on CD or by downloading. Bluesound offers inbuilt storage. Auralic can do the same for a small additional cost. But most products need a stand alone NAS or Network enabled storage. We don’t recommend storing it on your computer because if you have a large collection it will slow your computer down. Also computers fail and get changed pretty regularly and the last thing you want to be bothering with is ensuring you don’t lose extremely precious music files. A stand alone storage device that sits on your network is the best solution. These will plug into your router and allow access to your music regardless of if your computer/laptop is switched on. Such drives will generally plug directly into your router and don’t need to be anywhere near your audio system. 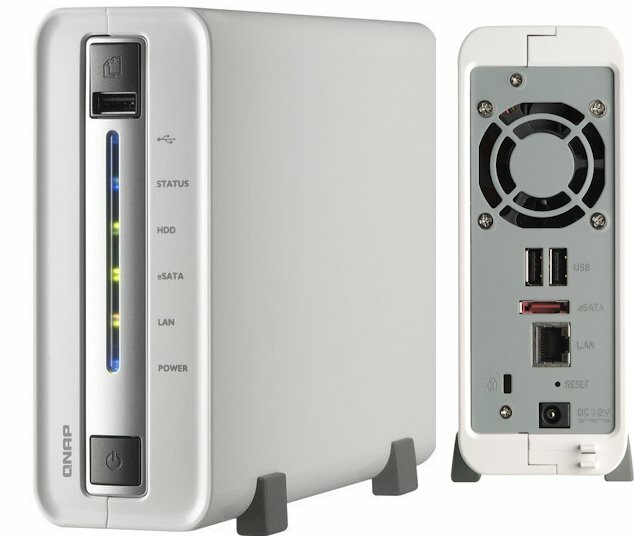 This is a QNAP Network drive and is perfect for the job. It connects to your network via a Ethernet cable and is compact and runs quietly. It can be left on and will spring to life when needed and “sleep” when not. It also has USB input which provided a one-touch backup feature. This enables you to take back up copies of your music library periodically for security. There are lots of other devices but we strongly recommend the QNAP. With a 1 TB drive inserted into it this unit it can store approximately 2,000 CD’s. These are reliable devices with all the software pre-installed to allow your music library to be browsed easily and reliably. Of course you can also download music to add to your library. With the advent of High Definition Audio we feel sure you’ll want to invest in some of your favorites. (especially when you hear them). But CD’s have never been cheaper and so the fastest and cheapest way to expand your library is to continue to buy affordable CD’s for as long as they remain available. As with all our content this is intended to give you a little insight. We’d be more than happy to discuss your own requirements with you in more detail. Call us on 0114 2756048 or email us to do this. Click here to discover High Definition Audio – the future of Hi-Fi.